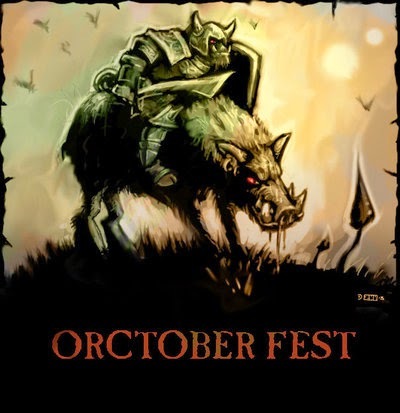 Welcome to Orctober! 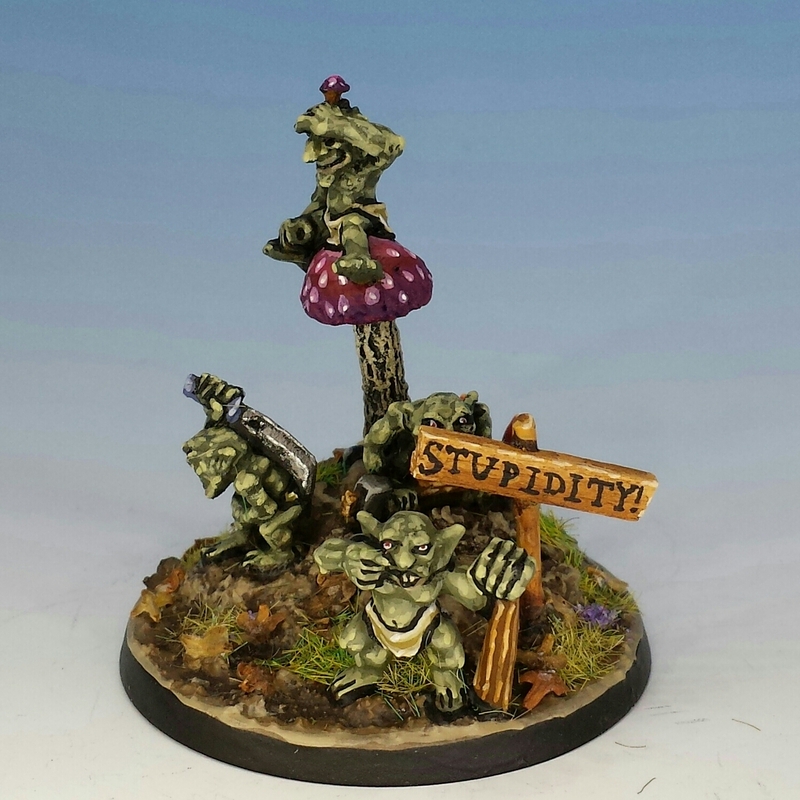 I'm proud to joining my fellow Oldhammer fanatics Erny (who invited me to the party) and Zhu (who drew the gorgeous Orctober Fest banner). I hope lots of others join the fun! Big. Bald. Green. This is now the iconic image of the orc, and it's one of Citadel/Games Workshop's enduring contributions to the fantasy genre at large. But it wasn't always so. In this post, I want to analyze the evolution of orcs (and their miniatures) from their beginnings to the present day. I'm thankful to a number of very talented miniature painters who joined me in providing the pictures to illustrate this evolution. Before Citadel came along, orcs were not big and green. As Zhu has demonstrated, monstrous orcs are the invention of JRR Tolkien. But Tolkien was vague about the appearance of what he named "goblins" in the Hobbit (1937), and "orcs" in the Lord of the Rings (1954), merely calling them "ugly" and arming them with "curved scimitars". However, we know they were short; in the Fellowship of the Ring, a "huge" orc-chieftan is remarkable for being "almost man-high". In his letters, Tolkien described orcs as "squat, broad, flat-nosed, sallow-skinned, with wide mouths and slant eyes." The short, sallow orc is tolerable as far as it goes, but unfortunately Tolkien went on to call them, "degraded and repulsive versions of the (to Europeans) least lovely Mongol-types." This is racist (re: the Mongolians) and ridiculous (re: the orcs). 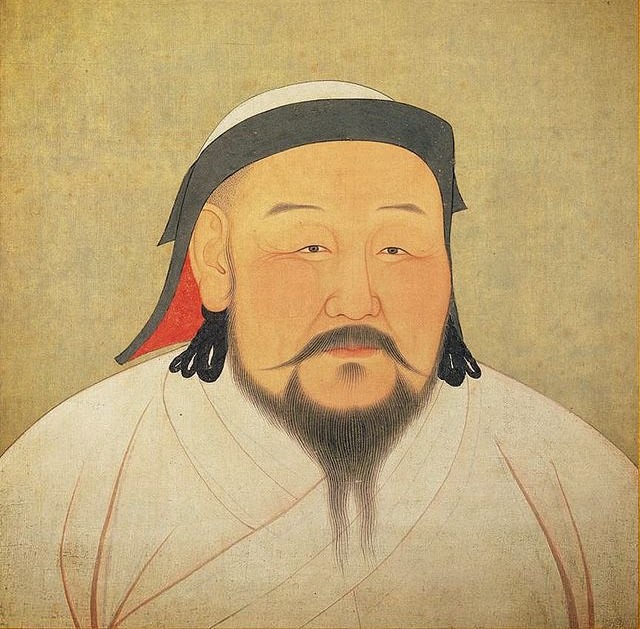 The Mongol king Kublai Khan is about the least orcish face I can imagine. In any case, what Tolkien leaves us with is a small, roughly Asian gremlin with a Saracen's weapons. Then Gary Gygax came along, and improved on Tolkien's orcs by wrapping them in bacon: "Orcs appear particularly disgusting because their colouration -- brown or brownish green with a bluish sheen -- highlights their pinkish snouts and ear. Their bristly hair is dark brown or black..." (Thus spake the Monster Manual). 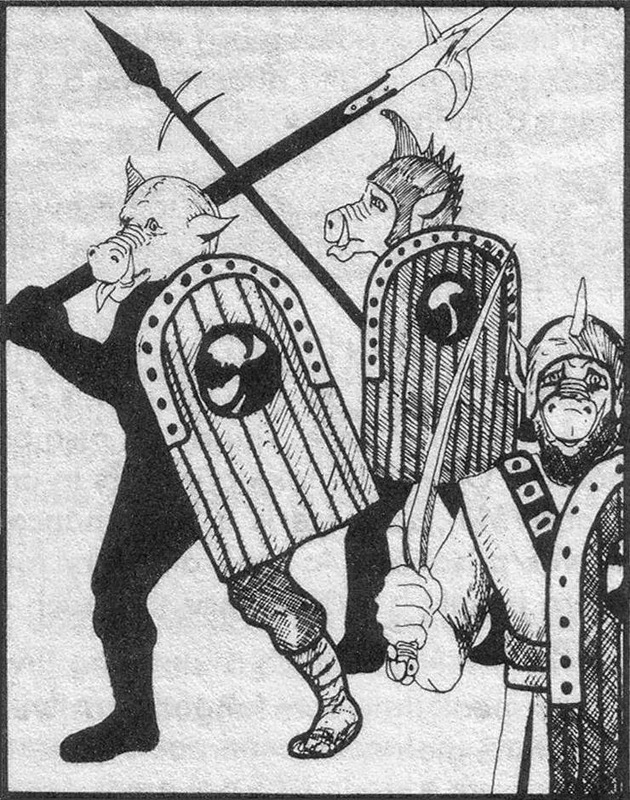 The artist Dave Sutherland III ran with this reference to snouts and made orcs into pig-men in his iconic image in the Monster Manual (1977). Gone is the eastern-tinged scimitar, the slant eyes and the broad face. But hairy, porcine orcs didn't inspire miniature sculptors (with a few exceptions). 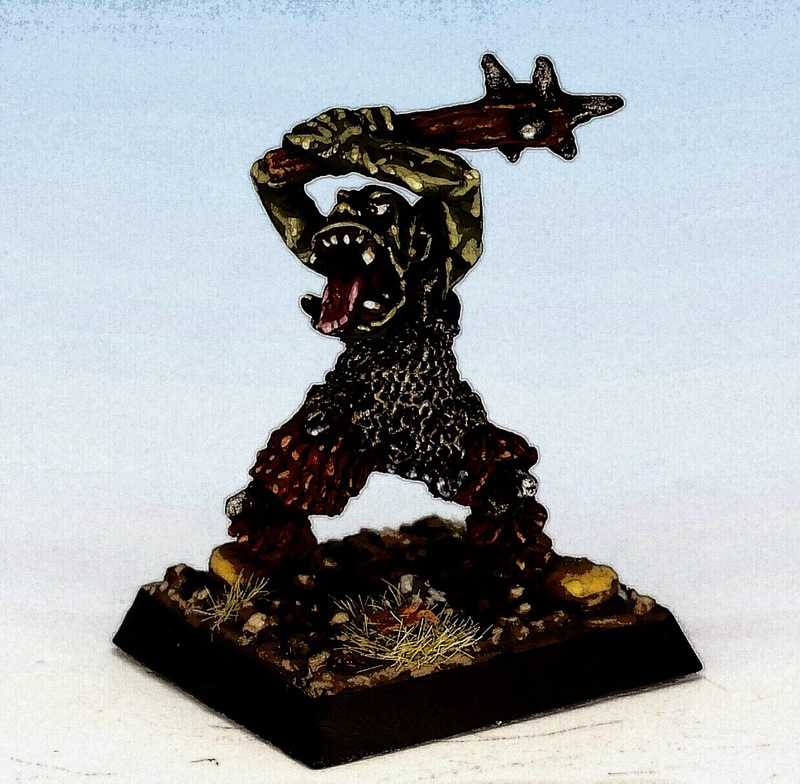 Most early orc miniatures were ugly and fanged in a generic sort of way. This simple pattern continued in the early Citadel sculps (like the Fiend Factory's Red Orcs launched in 1979). But somewhere around 1982, under Bryan Ansell, Citadel orcs began to evolve. 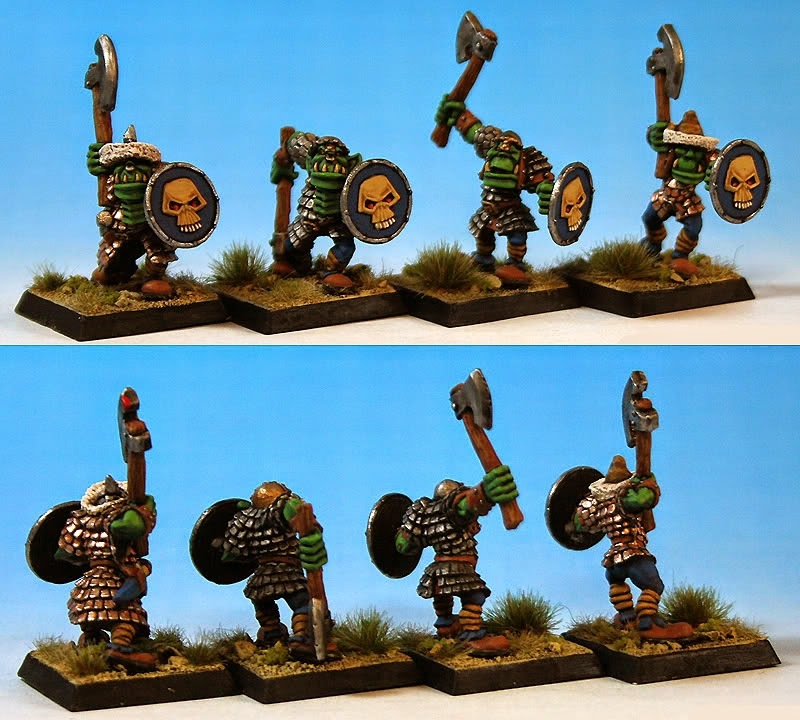 Starting with the Fantasy Tribe range, their skulls became elongated, allowing for an exaggerated jaw and underbite. The ear became pointy, the brow beetling, the head smooth. Orcs became taller but they also grew more stringy, with long, apish limbs. They turned into a new race. In my view, Harboth's Black Mountain Boys are the best example of these early orcs. 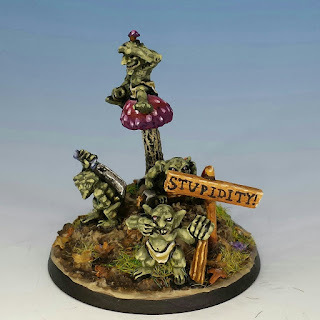 I don't own any of these striking miniatures, but here's one (with slight conversions) painted by Peter Armonstrong and posted to his excellent blog. I love those teeth! The next stage in the evolution of the orc occurred when Bryan Ansell hired a young novice sculptor named Kevin Adams. And all of a sudden, this new race of long-skulled beasties had their own Loki to blow life into them. Adams has many colleagues in the top tier of the sculpting profession, but no one (no one) has a greater talent for infusing orcish features with personality. During the mid-1980's, Citadel (and Adams) created the most compelling orcs ever released: grinning, boasting, clowning and yet always menacing. I will touch the orcs' subsequent history briefly. As with so much else, throughout the late '80's and '90's, Citadel took a "moar is better" approach to orcs, turning character into caricature. Their heads continued to expand, reaching hydrocephalic proportions. Weapons and muscles also became oversized. But worst of all, the joie-de-vivire that Adams invested into the race of orcs was gradually overtaken by nothing more interesting than savage violence. In my view, this genetic decline started with the Marauder sculps by Trish and Aly Morrison (1988), and headed downward from there. 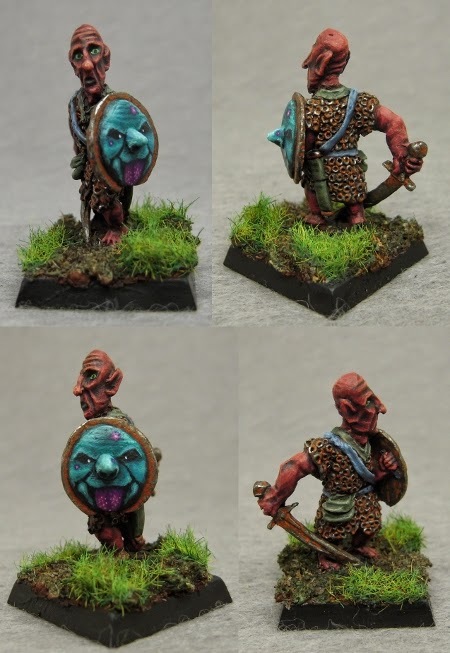 Although I don't love the Marauder Miniatures, I do love this paint job by Blue. His clean style gives these orcs a compelling comic-book feel. His bases are also a work of art. What does the evolution of the orc signify? That's up for grabs, with some people even writing academic papers on the subject. My own view is that orcs gradually changed because Warhammer gamers wanted to play games as orcs rather than merely fighting them as enemies in dungeons. Tolkien's Asiatic grotesques, or Gygax's pig-faced orcs simply don't have the depth or charm to make gamers want to inhabit them as characters. In the 1980's, the genius of Citadel was to reimagine orcs in the image of Citadel's clientele: a rowdy, gangley tribe of punks. The success of these Warhammer orcs was so dramatic that it influenced everything that came after. 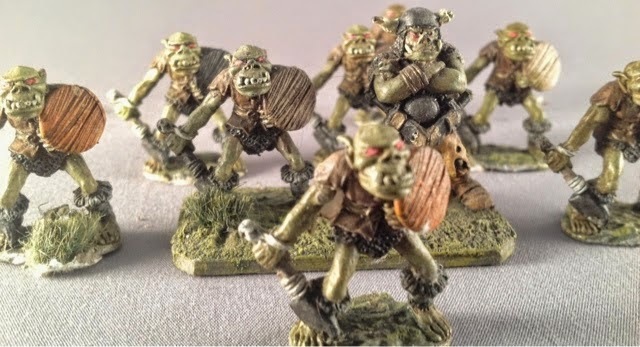 Although few game designers were able to maintain the mischievous mentality of Citadel's 1980's orcs, their physical image is stamped deeply into our collective imagination. Now systems as widely separated as World of Warcraft or Shadowrun feature the green skin and dramatic under-bite that was pioneered at Citadel. There's something in that face that says, "I'm big, I'm violent, and I'm also a lot of fun." Thanks for reading. Next week, we'll look at another stupid question: why are orcs green? Excellent sum up of orcishness. I'm no specialist but it all makes sense. I think the evolution of orcs is also part of their fun. Races like elves and dwarves have not undergone such big changes, only their outfit changed like ours do with every fashion. Orcs realy have evolved in their essence too. I really like those kev adams orcs/orks because they achieve that balance of mischief/brutality/fun/mistery that has never been equaled. 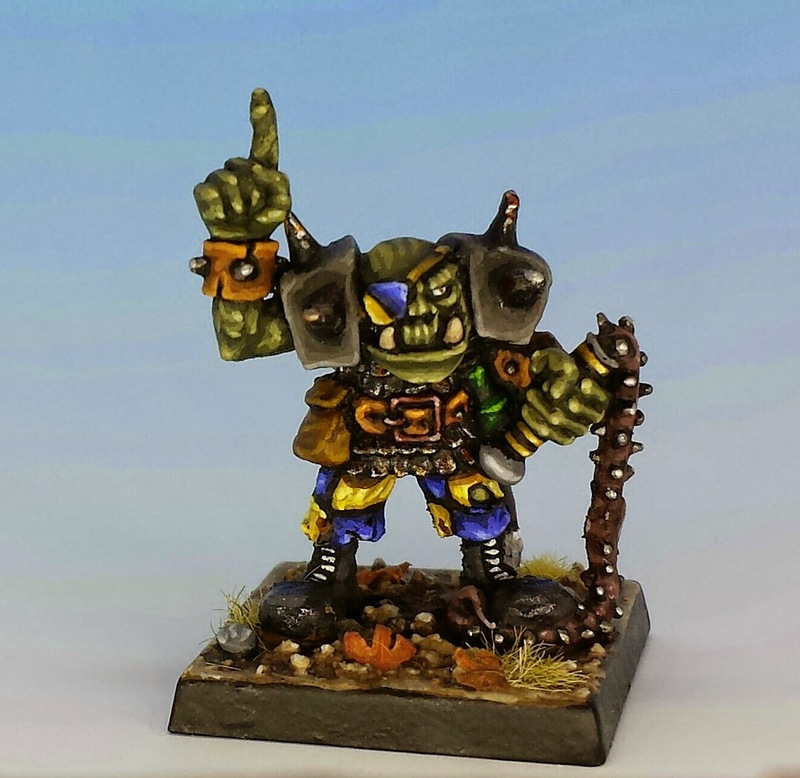 I've thought about some comparisons between Rogue trader orks and today's society I will post with my painted figures. Great post. 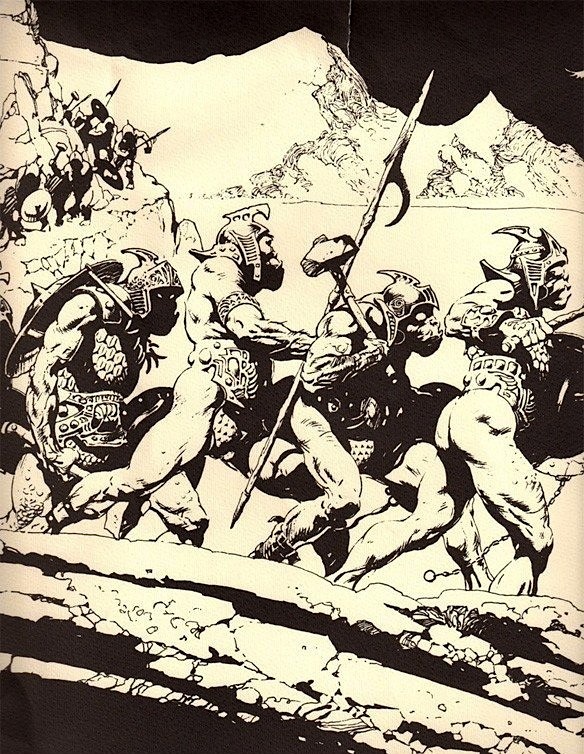 It's worth, in my opinion, looking at Frank Frazetta's 1975 drawings of orcs and comparing them to the early 80s Citadel designs (FTO series) especially around the face and bare arms / legs. Whether or not there is a direct influence, or just a similar notion of what an orc might look like, who knows? IIRC the "Red Orcs" started out life as "Half Orcs", so are, perhaps a little less 'orcy' because of that. Very interesting post. Your orc commander figure is great, even if it does make me feel bad about mine ;). I like the Marauder orcs myself. I thought the counterpoint of a regimented look was nice. Thanks for all the insightful comments! I've corrected my mistake about the Black Mountain Boyz - thanks for the pointer, Peter. And Zhu - I think you're quite right that the illustrators of the '70's were highly influential. As well as Frazetta, I really like the Bros. Hildebrandt's illustrations, like this sketch of some of Tolkien's orcs - notice the snouts! As far as I can tell, the Brothers were coming up with porcine orcs around the same time as Gygax (mid-to-late 1970's) - although Zhu has already observed that Gygax (and maybe the brothers?) may have been influenced by the "goons" of Disney's Sleeping Beauty (1959). Great summary Matthew, a history of Orcs but from a late 80's citadel being the end point perspective. I can get on board with that even if you don't like the Marauder boys who for my money have the look in spades. I'd say there is one important orc missing from your post. Highly influential on the look us 30-40 year olds consider the archetypal orc. Have a think about it and then have a look over on my blog to see if you agree. Nice article and I enjoyed the walk down memory lane.